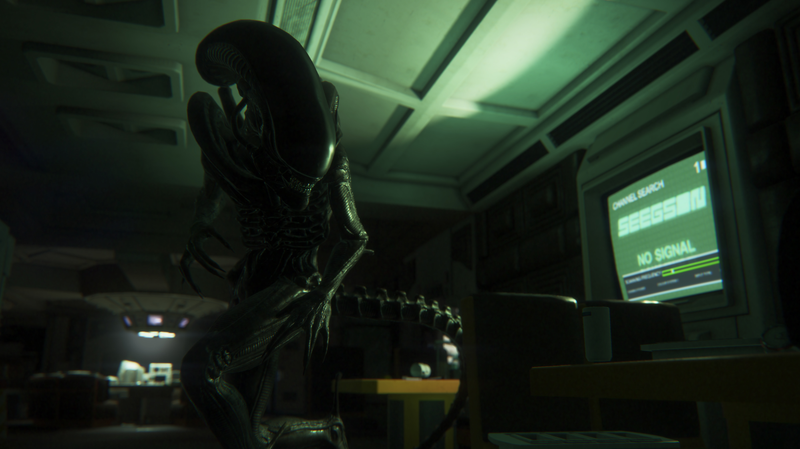 The alien, hunting Amanda Ripley in Alien: Isolation. Amanda Ripley, the daughter of Ellen, is back. Amanda occupies a strange, interesting little piece of the Alien canon. First mentioned in a cutscene from Aliens, Amanda was made the star of the original story of Alien: Isolation, the seminal 2014 video game that wove Ripley’s daughter into her mom’s xenomorph shenanigans. Now, after that game’s cliffhanger ending, Amanda’s back. Recently, Dark Horse announced that Aliens: Resistance, a new four-part series written by Bryan Wood, with art by Robert Carey, colors by Dan Jackson, and lettering by Nate Piekos, will pick up with Amanda, telling a new chapter in her story. It will, again, mirror her mom’s, as she gets roped into corporate conspiracies and a plot that ties into Dark Horse’s previous comic in the universe, Aliens: Resistance. Sounds pretty cool, honestly. Amanda, cast in the shadow of a mom she doesn’t know, is a fascinating character, and she deserves a more prominent place in the still-expanding canon than she’s gotten as of yet. The first issue of Aliens: Resistance will hit January 23, 2019, and check out the cover, drawn by Robert De La Torre, below. The cover of Aliens: Resistance #1.